Soon it will again be that time of year when herpetologists of The Orianne Society conduct intensive field surveys for our flagship species, the Eastern Indigo Snake (Drymarchon couperi). Indigo season officially opens November 1, and runs through the end of March. “Indigo Season” — just what in the world is “Indigo Season”? During this period we will carry out hundreds of Indigo Snake surveys at sites sprinkled throughout southern Georgia. These inventory and population monitoring efforts will occur on public and private lands, with a special focus on sites within the Altamaha River Drainage — a region known to support a large Indigo Snake population of conservation significance. The seasonality of the survey period directly relates to the ecology of the Eastern Indigo. Although adults of this species may utilize Gopher Tortoise (Gopherus polyphemus) burrows year-round (for retreats, foraging, nest sites, and dens while going through the process of shedding their skins), the day-to-day use of the burrows by adult snakes increases dramatically with the advent of cool November temperatures. In fact, for the remainder of autumn through winter into early spring, it is safe to say that with rare exception all of south Georgia’s adult Indigo Snakes lodge each and every night in the depths of tortoise burrows. Comparatively speaking, during the cooler months Indigo Snakes are more surface-active (basking, moving between dens) than most snake species native to south Georgia. They breed during this time of year (October-January) and they often shed their skins on the ground close to the tortoise burrows. These behaviors allow us to reliably survey for them on the vast barren sand ridge habitats where they overwinter. In an attempt to verify the presence of an Indigo Snake, a tortoise “burrow camera”, attached to a 25-foot length of tubing, is sometimes “snaked” to the bottoms of burrows (often every bit as long as our tubing!). Captured Indigo Snakes are processed (i.e., weighed, measured, and marked with a uniquely-coded microchip) in the field or in the laboratory. Obviously, field work with such an impressive snake is very exciting and rewarding (especially when we recapture a snake marked in a previous year). However, we do experience “survey days” that essentially amount to long, meditative walks. One survey site, a small and quaint ridge with sharp relief, has left quite an impression on me: here, over the years, we have enjoyed a number of close-up and personal encounters with large Eastern Diamondback Rattlesnakes resting near burrows, not to mention the many Bobwhite Quail and American Woodcocks that have exploded from underfoot! 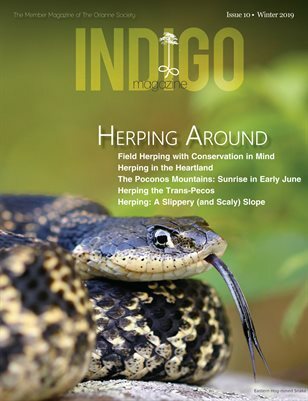 Our partners in these Indigo Snake monitoring studies include the Georgia Department of Natural Resources (GA DNR), the Department of Defense, and The Nature Conservancy. We are now in the third year of a GA DNR-supported study. The aim of this study is to determine the appropriate field study design and methods that will enable us to track Indigo Snake population changes over time (with respect to occupancy of overwintering habitat, for the Altamaha River watershed). The data collection portion of this study includes surveying 40 different sandhills within the river basin, four times per field season. With colleagues, we have recently published or are preparing scientific articles related to Eastern Indigo Snake population growth and survival, the species’ current distribution, and survey. Currently, my colleague Dr. Steve Spear of The Orianne Society, is analyzing close to 300 shed skin and scale clip samples as part of a population genetics study.